The Venerable Calhoun Walpole was appointed by Bishop vonRosenberg to serve as the Archdeacon of the diocese, on a half-time basis, effective March 1, 2013. Callie's responsibilities as Archdeacon include service as Convention Secretary and as clergy transition officer and resource person for other programs in The Episcopal Church in South Carolina. Callie continues as Vicar of Grace Episcopal Church in Charleston, and has her office at Grace Church, 98 Wentworth St., Charleston, SC 29401. She can be reached at (843) 723-4575 or by email at cwalpole@episcopalchurchsc.org. A native of John’s Island, Callie was a member of St. John’s Episcopal Church from her baptism until she entered seminary, and served there on the vestry and in other capacities. She also served the Diocese as Missioner for Hispanic Ministry and as lay vicar for the congregation of San Juan on John’s Island. She has coordinated the diocesan companion relationship between South Carolina and the Dominican Republic. Callie graduated from The University of the South with a Master of Divinity degree in 2005. She has taught Spanish at Burke High School and at Bishop England. She served as assistant rector of Holy Cross Faith Memorial Episcopal Church on Pawley’s Island from 2005-2008. In 2009 she was named Vicar of Grace Episcopal Church in Charleston, where she continues to serve on a half-time basis. From February 2012 through February 2013, Callie also served as Priest in Charge at St. Mark's Episcopal Church in downtown Charleston on a half-time basis, bringing leadership to that historic congregation while it was without a rector. A collection of reflections is now available in a booklet written by the Archdeacon of the Diocese, the Venerable Calhoun Walpole. 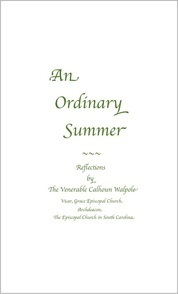 Callie writes about images drawn from the Lowcountry and throughout South Carolina – ordinary images such as sweetgrass, a joggling board, tidal pools, bricks, walls, and buzzards – that enable us to reflect on the goodness of God and the theme of growth through struggle. Copies of the booklet are free and can be obtained from the Grace Church office (843-723-4575) or by contacting Callie at cwalpole@episcopalchurchsc.org. You can also read it online as a PDF file here.